Chloroplasts are the site of photosynthesis in eukaryotic cells. They are only present in photosynthetic cells like plant cells and algae. There are no chloroplasts in animal or bacterial cells. Chloroplasts can be found in the cells of the mesophyll in plant leaves. In different plants chloroplasts have different shapes, they vary from spheroid, filamentous saucer-shaped, discoid or ovoid shaped. They are vesicular and have a colorless center. Some chloroplasts are in shape of club, they have a thin middle zone and the ends are filled with chlorophyll. In algae a single huge chloroplast is seen that appears as a network, a spiral band or a stellate plate. The size of the chloroplast also varies from species to species and it is constant for a given cell type. In higher plants, the average size of chloroplast is 4-6 Âµ in diameter and 1-3 Âµ in thickness. Outer membrane – It is a semi-porous membrane and is permeable to small molecules and ions, which diffuses easily. The outer membrane is not permeable to larger proteins. Intermembrane Space – It is usually a thin intermembrane space about 10-20 nanometers and it is present between the outer and the inner membrane of the chloroplast. 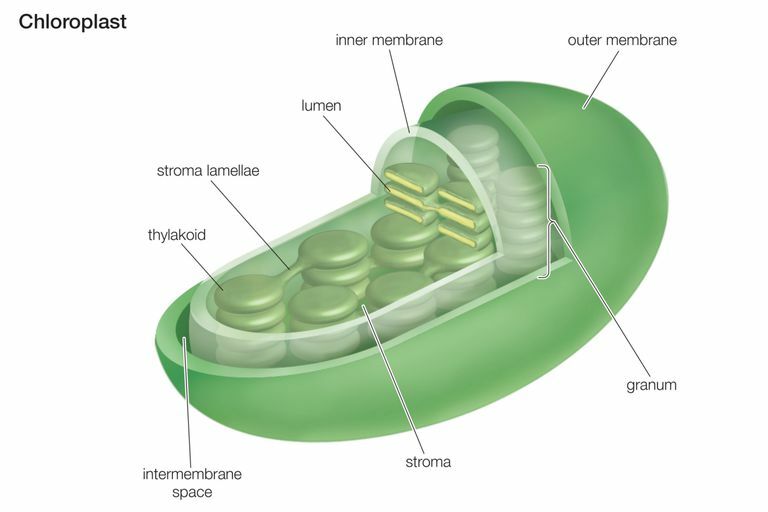 Inner membrane – The inner membrane of the chloroplast forms a border to the stroma. It regulates passage of materials in and out of the chloroplast. In addition of regulation activity, the fatty acids, lipids and carotenoids are synthesized in the inner chloroplast membrane. Stroma- Stroma is a alkaline, aqueous fluid which is protein rich and is present within the inner membrane of the chloroplast. The space outside the thylakoid space is called the stroma. The chloroplast DNA chlroplast ribosomes and the thylakoid sytem, starch granules and many proteins are found floating around the stroma. Thylakoid System- The thylakoid system is suspended in the stroma. The thylakoid system is a collection of membranous sacks called thylakoids. The chlorophyll is found in the thylakoids and is the sight for the process of light reactions of photosynthesis to happen. The thylakoids are arranged in stacks known as grana. Each granum contains around 10-20 thylakoids. Absorption of light energy and conversion of it into biological energy. Production of NAPDH2 and evolution of oxygen through the process of photosys of water. Production of ATP by photophosphorylation. NADPH2 and ATP are the assimilatory powers of photosynthesis. Transfer of CO2 obtained from the air to 5 carbon sugar in the stream during dark reaction. Breaking of 6-carbon atom compound into two molecules of phosphoglyceric acid by the utilization of assimilatory powers. Conversion of PGA into different sugars and store as stratch. The chloroplast is very important as it is the cooking place for all the green plants. All heterotrophs also depend on plasts for this food. In plants all the cells participate in plant immune response as they lack specialized immune cells. The chloroplasts with the nucleus and cell membrane and ER are the key organelles of pathogen defense. The most important function of chloroplast is to make food by the process of photosynthesis. Food is prepared in the form of sugars. During the process of photosynthesis sugar and oxygen are made using light energy, water, and carbon dioxide. Light reactions takes place on the membranes of the thylakoids. Chloroplasts, like the mitochondria use the potential energy of the H+ ions or the hydrogen ion gradient to generate energy in the form of ATP. The dark reactions also known as the Calvin cycle takes place in the stroma of chloroplast. Production of NADPH2 molecules and oxygen as a result of photolysis of water. By the utilization of assimilatory powers the 6-carbon atom is broken into two molecules of phosphoglyceric acid.